I fell in love with Nacpan Beach the very first time that I went there. And I’ve been visiting this place countless of times ever since my blog post about it. There was even a time that I went there alone. I love how it represents an untouched side of El Nido. I love how laid back it is and I love that you could walk in its long beach lined with only vegetations and coconut trees and just take a dip on the slowly descending shores whenever I want to. 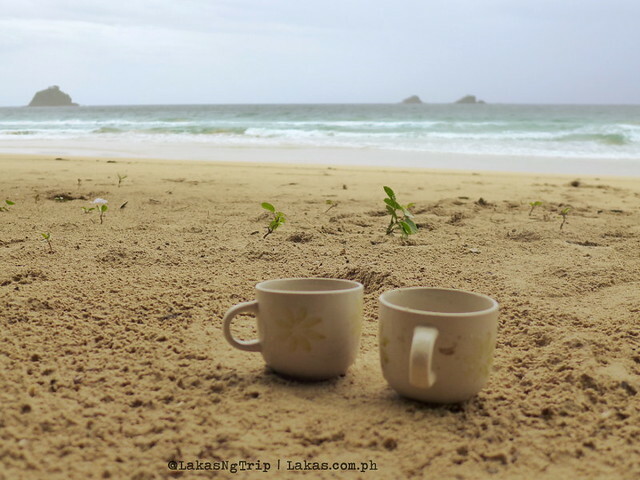 There was even a time I was sitting on the sand and drinking coffee while waiting for the sunset while rain clouds were dominantly scattered above. And I still loved it. It was a bummer though that I did not get to see the sunset that time. I’ve always wanted to stay there for a night. Actually, I already did last year and I just did it again last month with my former officemates who visited me here in Palawan. And so after our Island Hopping from the town proper and a long wait because the tricycle driver forgot our arrangement to fetch us right after the island hopping tour, we got there around 8PM. Tired, sticky and espasol-like from the dust on the road going to Nacpan Beach. For that night we stayed at Jack’s Place. 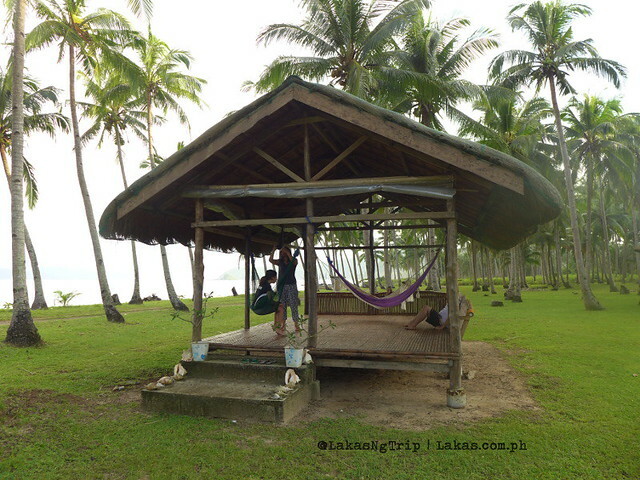 If you’ve read about my blog post on Stella Maris in Bataan, you would have known that I love minimalists resorts with lots of open space, well maintained grass and concreteless pathways and Jack’s Place offers just that. Plus their rooms are made mostly of wood and indigenous materials with only less concrete. We booked 2 rooms in one bungalow that shares a bathroom which costs 1,000 Pesos/room/night*. I would highly advise if you are a family or more than 3 persons you stay here. One of the rooms in the 2 room bungalow. 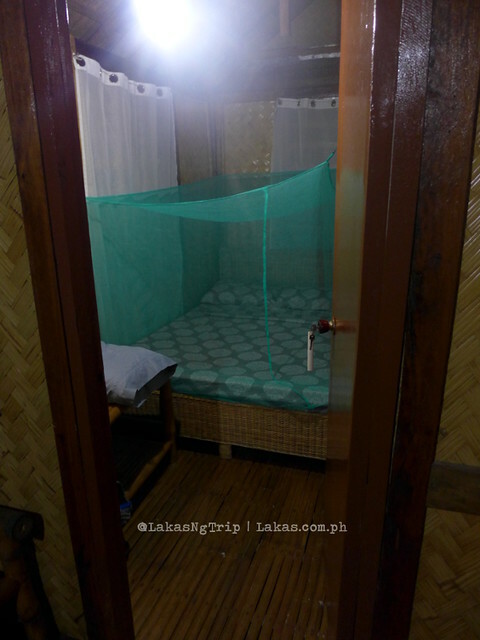 If you’re a couple I would highly suggest that you stay at their 1 room bungalow (1,200 Pesos/room/night)* because the bathroom on the 2 room bungalow opens to the 2 rooms. Inside the 1 room bungalow. So in order for you to have some privacy inside the bathroom you would need to lock both doors. Which would lead to the next problem, the people on the other room would always forget to unlock our side of the bathroom. Which would make us knock in the door of the other room for them to unlock our door to the bathroom. Imagine doing that in the wee hours of the night with people you do not know on the other room. 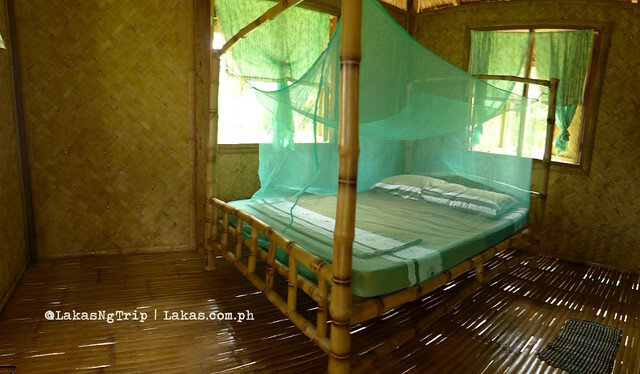 A note on the rooms they are more like your typical bahay kubo. 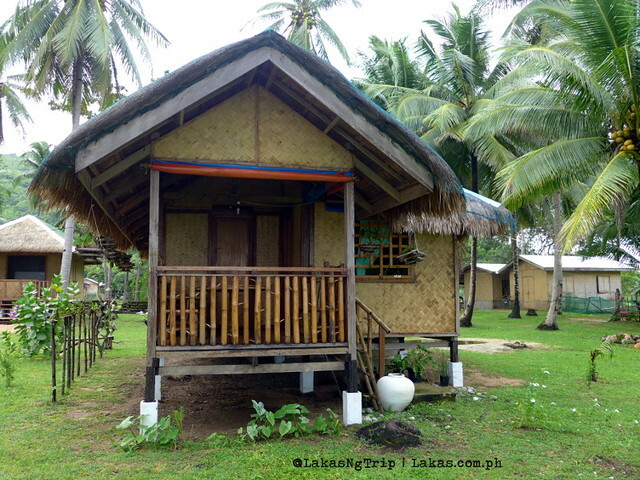 Weaved bamboo walls and strips of bamboo floor with a roof made of cogon. Which is also the reason why I loved the rooms. 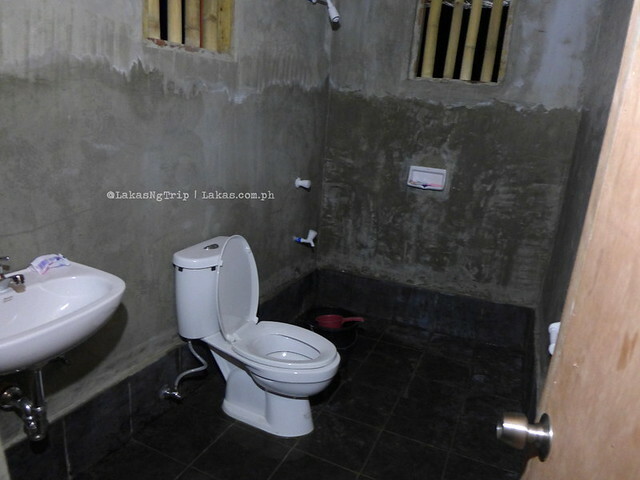 It’s not your typical concrete room that you get to sleep in and you still get to have a nice bathroom. Plus it really blends with the environment. Another 2 things I loved about this place is that the bungalows are widely separated apart. Plus each bungalow has a veranda where we just sat down, relaxed and played cards. The room on the other end was even hanging their hammock which I really envied. There’s also a common area hut where you can interact with other travellers. So be sure to be open for conversations to random strangers when you sit down here. Common Area where you can interact with other travellers. According also to the staff that they also have tents where you can stay which can fit about 8 persons. The rate was 800 Pesos/tent*. Unfortunately, on the 2 times I stayed there I never saw their tent setup. I also like it that Jack’s Place did not put the rooms right in front of the beach as this destroys the facade of Nacpan Beach. There are electric sockets for each room but you have to time your charging because electricity was only available from 6AM to 9PM. For lights after 9PM they provided us with flashlights. There’s also no cellular network in the area too. You need to walk a couple of meters just to get a signal. I like it that there’s only limited electricity and no cellular network as I could get to interact with the people I am with without competing for their attention from their phones. Playing cards with the light from the flashlights they provided. The rooms during the time when there was still electricity from 6PM to 9PM. In terms of food the breakfast we ordered was good but it wasn’t wow. You can order from their menu and they also offer lunch/dinner. We ordered food from them and it took about 20-30 minutes so better to order in advance. When we asked for food for lunch they had a limited seafood so we headed to Catian Beach Restaurant, which is just about 20 meters aways from Jack’s Place. 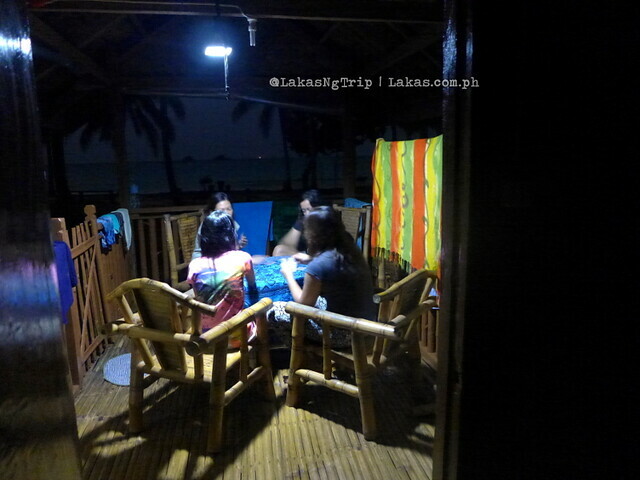 Jack’s Place has a small sari-sari store where you can buy some limited variety of food, drinks and toiletries. I would also like to note that the family that maintains the place were very hospitable and helpful. The logistics of getting here is a bit challenging too especially when you’re with a big group as when we visited there, the roads are not passable by vans. And it would definitley be a bumpy ride. Before it was passable by vans. 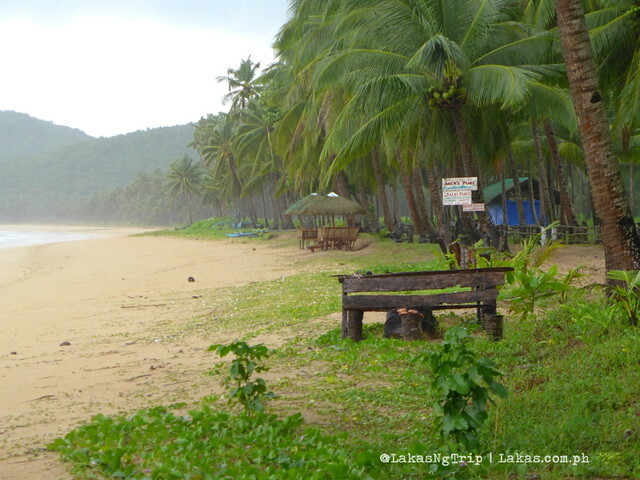 If you read my blog post about Nacpan Beach we rode a van going there but since the road was not maintained with the combination of vehicles passing by and rain it slowly degraded. Tricycles are your best bet if you’re going here with a big group. 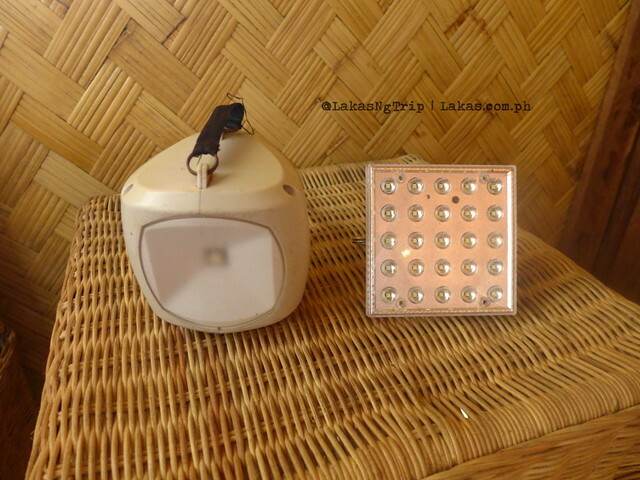 (1,000 Pesos/tricycle one-way). But if you know how to ride a motorcycle then I suggest that you ride a motorcycle going here. By the way, travel time is around 1 hour one-way. You would also need to tell your tricycle driver what time to fetch you the next day and do not forget to get their mobile number because they do forget. We stayed at Jack’s Place from 8PM and left around 3PM the next day and I definitely had a great time staying at Jack’s Place. 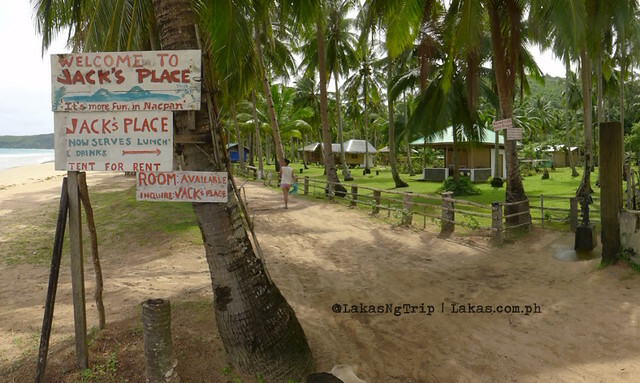 I wish Jack’s Place would stay the minimalist resort it was. 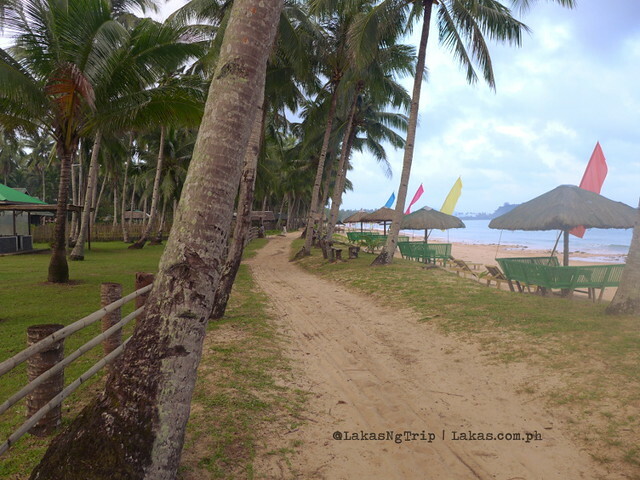 If you want to stay here I would suggest that you have the following itinerary so you would maximize your travel in El Nido. If you’re going to contact Jack’s Place, please tell them that you got to know their place from this blog (Lakas.com.ph). You will not get a discount but you would definitely help out this humble travel blog. * Please note that this is not an official website of Jack’s Place. Details like prices and schedules may change without prior notice. I agree that the beachline looks great without any infrastructures there. I hope it stays that way, its one of Nacpan’s characteristics that I love than I do El Nido’s beach. And I’m liking the common area Jack’s Place have, a good area for socials with other travellers. Looking forward to visiting Nacpan again. I hope they keep the rustic, and laid back feel to it though. Agree! The best characteristic about Nacpan Beach is that it still has less infrastructures compared to the beach in the town of El Nido. I’m actually afraid with the growing numbers of cottages right along the beach which would eventually destroy the facade of Nacpan if not controlled. It happend to Boracay, El Nido Town Proper and Anawangin already. Wow such a great place… hope that this place will be maintained like this… ibang iba na ang lugar kung maraming establishments na magsusulputan. Nasisira kagandahan ng isang lugar lalo na kung di naaalagaan ng maayos. Agree! Magiging iba talaga yung lugar kung marami na establishments na magsulputan. Sana nga ma-maintain nila ito na limited lang ang buildings and less concrete. Ang Nacpan naman ay pinupuntahan dahil sa ganda ng lugar dahil mukha talaga siyang untouched. Just for clarification, if I stay there overnight, I’d need to pay the tricycle driver P1,000 going there, then another P1,000 coming back to El Nido Town Proper? Yup! You need to pay the tricycle driver that. Some visitors rent a motorcycle. I’m not sure but you can try asking Jack’s Place if they could arrange a pickup. Thanks for this helpful blog, it looks a great place. Is it a good place for swimming? 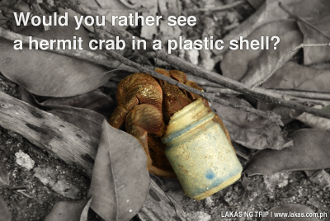 How about snorkeling, are there corals, beautiful fishes, and so? Good for swimming. Not good for snorkeling as the beach does not go deep immediately. I’m not sure though if you get farther from the shore. Usually when I am here I just lounge around at the shore and get wet on the water but I do not go far. Does Jack’s Place allow for tent accommodation if we stay there using our own tents? Last time we were here they were allowing tent accommodation. I’m not sure now. Hello lakas.. Thanks for your blog and we reached Jacks place. As of Sept. 2017, Jacks place family room is already 2,800 pesos with breakfast and 1,800 for couple room with bf. There electricity is from 2pm-4am. The price of rooms in Jacks Place become OVERPRICED and the room still a fan rooms. I suggest fellow beyaheros to check in at JDL resort (i cant remember exactly) you will see colorful family concrete rooms with aircon before you will reach jacks place. 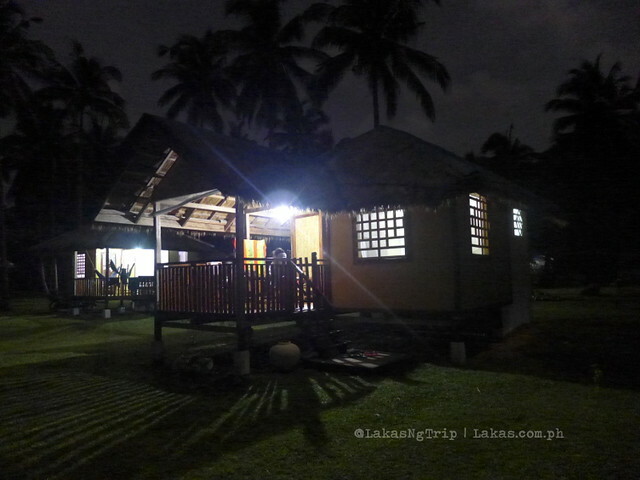 The owner said that family room with breakfast and aircon is only 2500 pesos. It was just newly built this month. Still Nacpan beach is perfect but they are NOT allowing to take picture at twin beach hill because somebody buy the area and no trespassing sign is written. Still bumpy road but concrete road construction is on going. 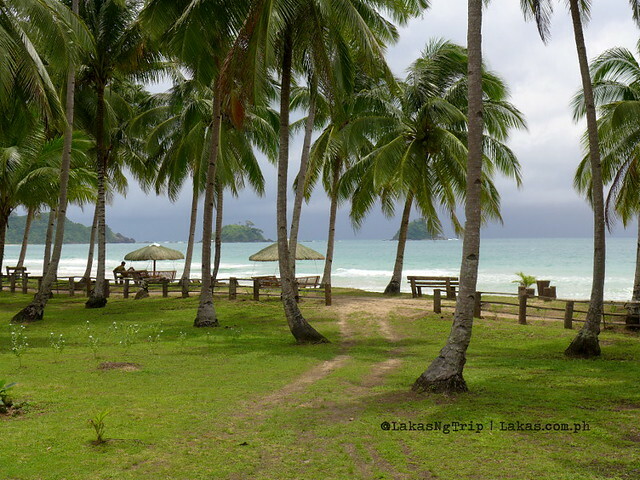 Tricycle payment from el nido to nacpan beach is 1,000 pesos… Next day pick up pay 1,000 pesos again. Hey Sammy! Thank you for the update. I’ve been wondering what the updates are in Nacpan Beach for a while. Sad to hear about being unable to take pictures of the Twin Beach. It was one of the charms of Nacpan Beach.